Enjoy your stay at our comfortable Schaumburg hotel. 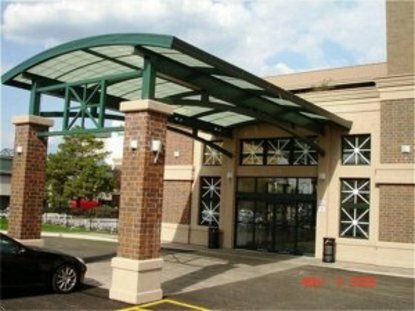 The Holiday Inn Express Rolling Meadows Schaumburg hotel is nestled in a suburban area that is conveniently located just 45 minutes outside downtown Chicago and just 15 minutes away from the Chicago O'Hare International Airport. Our new Chicago Airport hotel affords easy access to Interstates 88, 90, and 94 and provides a complimentary shuttle service to and from the airport several times a day. This Schaumburg hotel is situated in the vicinity of many businesses including Motorola, Zurich, Pepsi, Northrup Grumman and Komitsu. After a day of meetings, be sure to visit the Woodfield Shopping Center, Medieval Times or one of the many great restaurants in the Rolling Meadows and Schaumburg area. Our Chicago Airport hotel houses McKeena's Restaurant & Bar, a prime place to dine or have a drink after a long day of work or sightseeing. When you get back to your hotel room, you can easily check your email using the hotel's free high-speed, wireless Internet connection or the hotel's in-house PC. Satisfy your growling stomach before that early morning meeting with the free Express Start breakfast complete, with our Schaumburg hotel's signature cinnamon rolls. The Holiday Inn Express Rolling Meadows Schaumburg is the perfect suburban lodging near Chicago. This hotel is committed to providing accessible facilities under the American Disabilities Act. If your accessibility needs are not met, please contact the Hotel Manager on Duty. Should you require additional information regarding accessible facilities for guests with disabilities, please call 1-800-Holiday (U.S. and Canada) or contact the hotel directly. For the hearing impaired, TDD service is available at 1-800-238-5544 within the U.S. and Canada.